It is 1956 in Russia. Former MGB Officer Leo Demidov and his wife Raisa are trying to make a life for their odd little family. Raisa has only recently fallen in love with the man she was married to for many years before that but she could not love him while he carried out the brutal instructions of his superiors in the Stalinist regime but Leo had an epiphany three years earlier (depicted in the first book in this planned trilogy, Child 44) and stopped his violent activities. Now they are adoptive parents to Elena and Zoya whose parents were killed in an incident in which Leo participated and while 7 year old Elena is happy enough to join the new family 14 year old Zoya cannot forgive Leo for his role in her parents’ death. When Stalin’s successor Nikita Kkrushchev, gives a speech denouncing and apologising for the brutalities committed by the state under Stalin, one woman from Leo’s past who now calls herself Fraera begins a program of violent revenge which involves taking from Leo everything he holds dear. In an author interview included in my edition of this book Smith declared he wanted to write something with the excitement of the TV show 24 and I think he has succeeded (although I’ve only ever seen a handful of episodes of that show). It is a thriller in the Robert Ludlum style with action and plot twists a-plenty. We move at breakneck speed from Moscow to a prison ship to a Gulag to occupied Hungary and we watch people turn on each other again and again until this reader could barely keep track of who was on which side. I couldn’t help but compare this book to its predecessor which was one of my top ten reads of last year and the comparison is fairly unflattering. 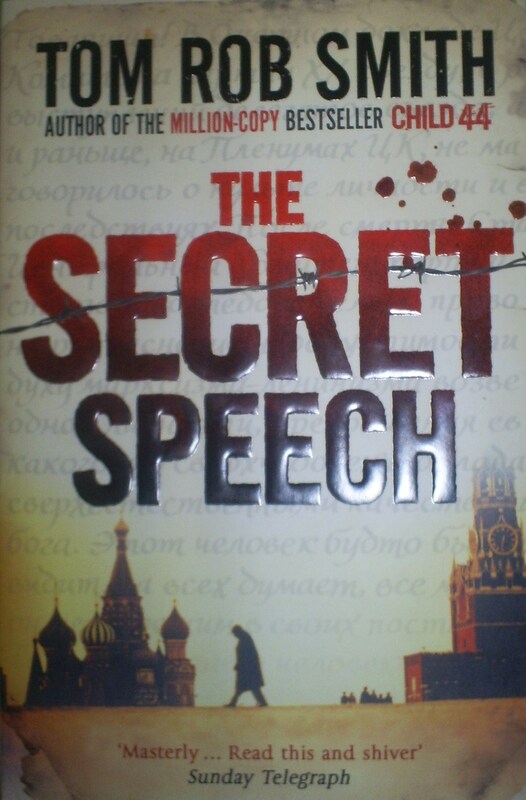 Where Child 44 provided subtle and intimate portraits of a range of people and depicted a quite breathtaking range of emotional stories The Secret Speech has a singular bludgeoning, violent tone and is full of people motivated primarily by self-interest, vengeance or both. There is really only one character whose motives are different and sadly she is not terribly well developed. For me the least impressive part of Child 44 was the final quarter of the tale which moved from careful psychological suspense to Hollywood style thriller and The Secret Speech has continued that later aspect without incorporating the pervading sense of oppression and fear that made the first book so compelling. Reading this book I never once forgot that I was reading a fictional tale whereas the first book was so absorbing that you could believe those decisions had been made and emotions had been felt by real people. The story here is overly complex and relies too heavily on a string of coincidences and unlikely escapes and the book is driven mostly by narrative instead of its characters. Leo is a far less complicated character in this novel, although there are glimpses of his insightful introspection when he considers the problem of his interactions with his adopted daughter. But whereas in the first book I could sense his angst about having done bad things for what he thought at the time were good reasons here he seems to have no compunction about doing bad things, presumably because the good reasons are different ones than before? The character of Fraera is used to advance much of the plot but I found her motivations confused and overall she was not convincing. She demands her gang members behave in exactly the same way as the State demanded of its workers like Leo (i.e. blind obedience regardless of the instructions up to and including murder) and I’m not convinced that having one of the characters point this out excuses the fact that it is a fairly blunt plot device (and really just increases the body count). If you’re after an adrenalin-filled thriller with loads of fighting and in-the-nick-of-time escapes then you will enjoy The Secret Speech and probably won’t need to have read the first book as Smith has done a good job of incorporating information from the previous book without making it too boring for those who have read it. It does weave real and fictional events together well too and if you’re anything like me it will send you off to ‘research’ (i.e. google) which of the events that were depicted were real. If you’re looking for something extra, like the intimate character portraits of Child 44 then I think you might be disappointed, though perhaps I was being unreasonable in expecting a second exceptional book. This entry was posted in Aussie Readers Summer Reading, book review, Russia, Tom Rob Smith. Bookmark the permalink. Bernadette – Thanks for this excellent review. I know exactly what you mean about plots where breakneck speed and nick-of-time rescues seem to be more prevalent than character exploration or subtle touches. I’ve enjoyed both kinds of books, actually, and I think both have their places. You’ve done a terrific job of outlining the difference. What a great review! I really enjoyed reading your thoughtful analysis. Who needs newspaper reviews with quality like this? Not me. I have not read either of Tom Rob Smith’s books – Child 44 looked to me to be a bit too harrowing and I had heard that the Secret Speech is not as good – I find these OTT thrillers not that distinctive so don’t have much patience with them. It seems a pity that the author has taken such a drastic change in direction for his second novel but maybe it is partly to do with commercial pressure or advice? Thanks again for the very thoughtful and interesting review, Bernadette. Glad you found the chance to read this. Everywhere I hear it’s been said it is not as good as the first one. Child 44 was my favourite read of year 2009 too.